Strap yourself in your chair. Put down the coffee mug. And make sure you have an empty stomach because you're about to take a ride in a flying roller coaster. Or well, the closest thing there is to a flying roller coaster. 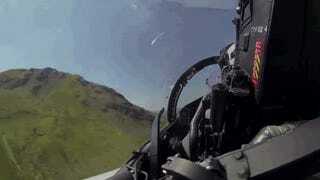 The video below gives you the backseat cockpit view of an ultra low flying RAF's Typhoon frontline jet fighter. The sights are incredible, the speed is fierce and the turns are just ridiculous. What a powerful machine. The jet cuts through the air and showcases the beautiful valleys and mountains at breakneck speeds. It's a complete thrill ride. The fun starts at about the minute mark in the video, which was spotted by The Aviationist.